Bad news today that Maro Itoje has been ruled out of the November Tests with a broken hand, joining fellow Sarries and England lock George Kruis on the sidelines. So the debate as to whether Itoje should move to the back row has now become somewhat redundant. 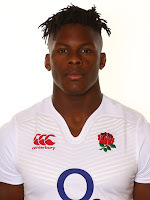 That his loss is such a major blow to England is testament to the impact Itoje has had this year - don't forget that he didn't make his international debut until February. I was there at Allianz Park on Saturday watching Saracens take on a strong Scarlets team and feared the worst when Itoje left the field injured after an excellent display. Sarries were, at times, ruthlessly brilliant, with Mako Vunipola, Owen Farrell, Nick Tompkins and Michael Rhodes all showing up well. If they ever do piece together an 80 minute performance then someone is going to take a fearful hammering. One of the reasons I was at Allianz Park was to attend the presentation of last season's Under 13 Herts & Middlesex Div VII league trophy to my son's team, which I have to say was a fairly surreal experience. With way too may people crushed into a fairly tight space, and with our boys there ready to step up to receive their deserved acclaim, it was was announced that, due to lack of space, only the coach and captain of each team should step forward to receive the trophy. Itoje has such a bright future..an incredible young talent.